Without deterrents, corrosion and rust would undermine the function of our infrastructures and increase expenditures by trillions of dollars. The process of corrosion is affected by the type of material that is selected for the operational environment (temperature, stress, pH, humidity) over the course of time. Corrosion can be reduced or prevented by using inherently corrosion-resistant materials, or through the incorporation of corrosion-inhibiting chemicals into protective films, coatings, and other end product formulations that come into with contact with the substance being protected. It is the incorporation of corrosion and rust inhibitors that is the most cost-effective method of corrosion control. This reference describes over 3800 trade name and generic chemicals used to prevent corrosion damage in application areas that include paints, coatings, and sealing compounds, water treatment, industrial and institutional cleaning, metalworking, fuel additives, heat exchangers, oil field chemicals, automotive chemicals, petroleum refining, production, and drilling. 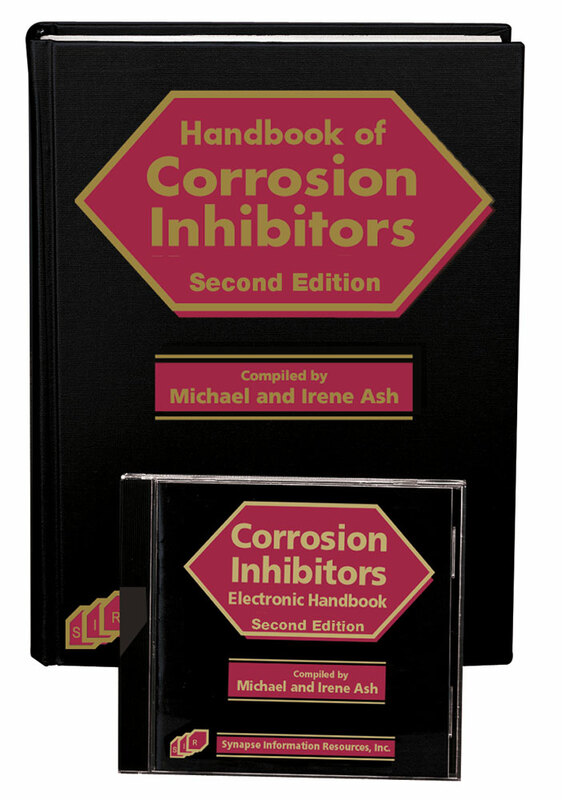 Both the Handbook of Corrosion Inhibitors-Second Edition and the software version are designed to function as a selection tool for corrosion-inhibiting chemicals. They centralize information on these currently available chemical additives from major manufacturers by profiling both trade name and generic chemicals, detailing their properties, uses, use levels, regulatory status, toxicology, sources for purchase, etc. This reference is organized so that the reader can access the information on these functional chemicals based on the trade name, chemical composition, function and application area, manufacturer, CAS number, and EINECS/ELINCS number. It is divided into four parts and includes three important Cross-References. Trade Name Reference provides an alphabetical listing of approximately 2800 trade name chemicals and materials that are used in corrosion-inhibiting formulations. Each entry includes the manufacturer's name; chemical/material description; its detailed functions and applications in all aspects of industry; physical properties, such as form, molecular weight, density, solubility, boiling point, cloud point, flash point, pH, freezing point, activity; toxicology, storage, precautions, etc. This section covers more than 1000 chemicals and materials that are contained in the trade name products profiled in Part I or generic chemicals that are not linked to trade names but are used in the formulation of corrosion inhibitors. Each entry contains information including the following: CAS (Chemical Abstract Service), EINECS/ELINCS (European Inventory of Existing Commercial Chemical Substances/European List of Notified Chemical Substances), and UN/DOT reference numbers, classification, definition, chemical synonyms, empirical and molecular formulas, properties, toxicology, precautions, storage, uses, use level, regulatory details, manufacturers and distributors. All chemical/material synonyms are cross-referenced back to the main entry. These entries/ are followed by a listing of the trade name products that are either equivalent to the monograph entry or contain it as one or more of its ingredients. This is a powerful tool for locating the trade names and chemicals based on their function and/or industrial application area. By searching for key functional words related to corrosion protection such as corrosion inhibitor, corrosion remover, rust preventive, dipersants, film-former, neutralizer, oxygen scavenger, passivator, or specific application areas such as potable water, steam generators, boiler water treatment, recirculating water and cooling towers, oilfields, pipelines, storage tanks, coolants, coatings, etc., the user is directed to the trade names and/or chemicals that have that specific functional/application attribute. The generic component names are distinguished from the trade names by italic type. The directory contains detailed contact information for the more than 2000 worldwide manufacturers and their branches of trade name products and chemical components that are referenced in this handbook. Wherever possible, telephone, telefax, toll-free numbers, e-mail and Internet addresses, and complete mailing addresses are included for each manufacturer.